It's been seven years, almost to the day, since I started this blog with this post. After 527 posts, 80,000 page views and endless memories, the time has come for me to sign off. I know that Mrs. Shelley Kutliroff, the MHA's new interim Dean, intends to continue sharing all of the wonderful things that happen in this special school with all of you and once she gets settled in she'll reach out and let you know exactly how. As for me, I'm going to continue blogging on my new site gilperl.com, though the posts will more closely resemble the pieces I've been writing over the years as the Message from the Dean in the school's newsletter. As these essays are intended to provoke thought about issues critical to education, the Jewish community, and our children's future, I hope you'll subscribe to the site and join in the conversation. Thank you for reading. Thank you for caring. Never have I seen a high school graduation quite like the one we had last night. While it is a long-standing tradition here at the MHA that each of the graduates speak, and while there have been impressive individual performances in the past, never have I heard anything quite like what I heard last night. One after the other, all twenty graduates rose from their seats upon the stage and took their place at the podium. One after another, they dazzled the crowd with their poise, creativity and confidence. No two speeches were even remotely alike. From a touching letter to a younger brother to a speech begun in American Sign Language and from famous movie lines bellowed from upon a chair to moving tributes to teachers for their care, there wasn't one of the twenty that failed to impress. This is one of the most talented groups of young men and women ever to graduate our school and we can't wait to see where they go from here. We had two opportunities this past week to stop and reflect on just how much our little one have grown. The first was Kindergarten graduation, an annual rite of passage, in which we ooh and aah over those adorable kids who - in the course of three years - transformed from toddlers barely capable of speaking in full sentences to students who can read, write, think, research, question, discover, and explore. As always, Morah Michelle, Morah Hanielle, Moreh Shimshon, and Mrs. Triplett helped our kids put on quite a show. By the time it was over no one had any doubts that all of our Kindergarteners were more than ready for 1st grade. Just a day later it was our 8th graders turn to show us what happens when little 1st Graders finish that magical ride we call Elementary and Middle School. Brimming with confidence and teeming with poise, each one of our "advancees" addressed the crowd with lessons they had learned from the extensive geneology project which they each just recently completed. During the collation which followed the ceremony, parents and friends had the opportunity to mill about the gym and explore these projects in even greater depth. The quality of their research and the creativity with which they expressed it was truly a site to behold. All of the pictures from Kindergarten Graduation can be found here and 8th Grade Advancement pictures can be found here. Mazal tov to all! For the second year in a row, Mrs. Leora Klein's sixth grade capped off months of learning about the Mishkan by building one. Last week, students of all ages were treated to tours of their life-size model led by some of the most knowledgeable 6th grade docents I've ever seen. New for this year were the bigdei kehunah, the garments worn both by the Kohen Gadol and the Kohen Hedyot. It was truly inspiring to see how much knowledge and deep understanding about the construction of the Mishkan and its vessels our 6th graders gained by constructing it themselves. The following incredible essay, authored by our own 12th grader Hudis Lang, was just published on Fresh Ink, a website by and for teens sponsored by the Jewish Week. The florescent lights glared on the tile floors, and the gray walls of the waiting room surrounded me and my mom. I glanced at my mother — or at least she looked like my mother. It all seemed so casual, I was sitting next to my mom waiting for her to be called for her daily radiation treatment. Realizing where I was and who I was with, I leaned over and gave her a small hug. I hoped that even though her memory was fading, she would still remember I loved her. While in the waiting room something inside me had changed. I had a new perspective on life. Rewind to two weeks before this, I was sitting in class checking my phone, just like any other day. However, this time it was different. I looked down and I saw that my oldest sister had texted me — an odd and rare occurrence. The text was extremely long and had been sent to everyone in my family. I began to read and the words seemed to slip off the screen and started to circle around my head. I could not quite grasp what was going on, nor did I want to. All I wanted was to delete the text like it never was sent. I did not want to comprehend what was written. I ran out of the classroom holding back my tears as I began to make sense of what I had just been told. Over the past week both our boys and girls high school students experienced chesed in the truest, most genuine sense of the word. For our girls it was the culmination of a year-long partnership with a local branch of the Special Olympics. For the boys it was full day spent in manual labor, assisting the disaster relief efforts in Tupelo, Mississippi as they recovered from the recent spate of tornadoes that hit the mid-South. Both programs were organized by Rabbi Noam Stein, our Director of Student Life, and his descriptions are below. Both programs demonstrated to our students and to all of us, the power our children have to make our world a better place. 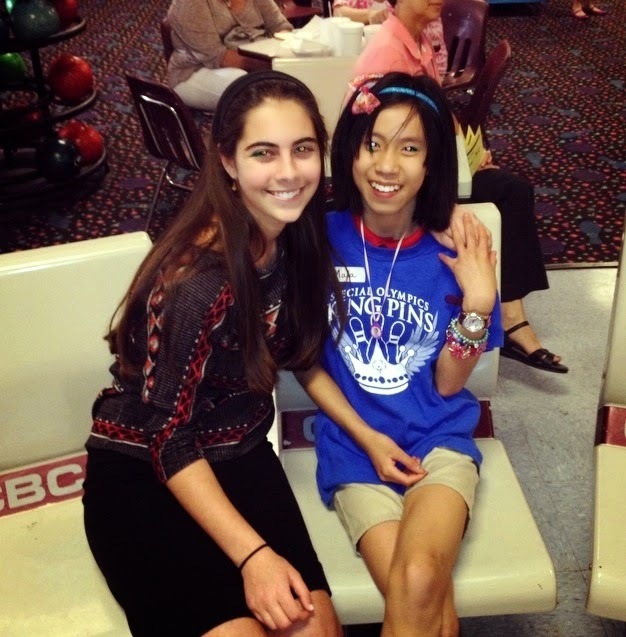 This year the GMSG participated in the Special Olympics bowling league. Athletes in the league are developmentally, and often physically, disabled children and adults. Volunteers in the league help the athletes who need help, cheer, schmooze and interact. Aside from the physical assistance, the main purpose of volunteering is to create a natural environment for interaction between the disabled and mainstream populations. Each of our students volunteered at the program, which required taking some time from school and some additional time from the students' personal time, once every other Monday. As a group, we helped staff the program every week. The program was founded by David Ross and his late wife who found it to be an essential activity for their developmentally disabled daughter. Throughout the year David has been an essential educational and supportive resource for our students. The closing awards ceremony was held on Monday, May 4th. Volunteers who had maintained steady attendance at the program received certificates of commendation. Each of the GMSG students received a certificate. Our school was also awarded a plaque in appreciation of being one of two schools to provide the most volunteers to the program. In addition, 12th grader Rachel Tsuna, who has been volunteering at the program since last year, received a $500 scholarship in appreciation of her committed service. On Monday of this week the 11th and 12th grade boys went to an area outside of Tupelo MS to partner with Nechama, a Jewish disaster response organization. We spent the day on a chicken farm. The chicken coops, which had tin roofs, had been completely destroyed by the tornado two weeks ago. Mangled slabs of tin were scattered over a radius of at least a mile. The slabs were stuck in trees and brush that had also been uprooted by the tornado. The boys collected the tin and beat it back into flat pieces so that it could be hauled off the property. The homeowners, a wonderful family with whom we had the opportunity to interact, were recycling the tin in order to try and make back a small portion of the money they lost in the disaster. Throughout the day it was brutally hot, and the labor was hard. The boys did a tremendous job of helping this family. At the end of the day, the homeowner came to shake each one of our hands and thank us. He told us that of all the volunteer groups that have come out, our boys worked the hardest. As he said, taking time to do this kind of work for people really shows what kind of person you are. The boys made a real kiddush Hashem with some people who have had very little interaction with Jews before. Even if Parker Mantell weren't a graduate of the Margolin Hebrew Academy, the speech he gave this week before 17,000 people at Indiana University's Commencement Exercises would be well worth watching. The fact that he's one of our own makes it all the more special. To Julie, Gary, and all of his teachers along the way: thank you for encouraging and inspiring him. To Parker: thank you for encouraging and inspiring us. "The Best Day of the Year"
Over and again throughout the years, I've heard students use that phrase to describe Yom Ha'atzmaut at the MHA. Yesterday certainly didn't disappoint. Our kids were welcomed to a building which our talented shlichim decked out as a grand tiyul ba'aretz replete with rolling fields, flowing waterfalls, boulders painted with trail markers, and the requisite ibexes. Following a tefilah chagigit students traveled through different classrooms - each set up as a different destination in Israel - where one of the benot sheirut or Torah MiTzion bachurim, assisted by an 8th grade student, helped the children to learn about that place and do a related activity. Following the road signs posted at the hallway intersections, the elementary school students then headed outside (steering clear of the High School boys who were intensely engaged in pizza-eating contests, wheelbarrow races, and ping-pong ball balancing as part of their Maccabiah Games). On the blacktop they rotated through a Bedouin tent where they made fresh pita, a station where they made Israel themed t-shirts, and a station where one of our IDF bachurim gave them a very gentle introduction to basic training. The morning culminated with a festive Israeli lunch and we were thrilled that so many parents came to join us. Of course, the highlight of the day was our annual march, for which we were joined this year by students from the Bornblum Solomon Schechter. As always, the march was lively and spirited all the way from our front door to that of Baron Hirsch. Once we arrived, everyone was treated to snacks and the older kids went to hear some divrei Torah and chizuk from Rav Shai Finkelstein while the younger students watched a series of short, Israel-themed videos. After fifteen minutes the groups rejoined each other for one last set of dancing before dismissal. Have a look at the pictures here and the video below and you'll begin to understand why students fondly call Yom Ha'atzmaut at the MHA the best day of the year. 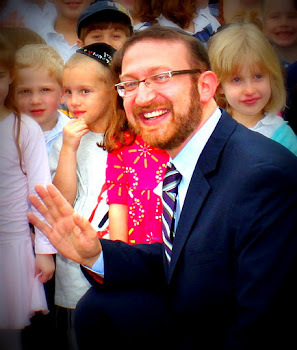 These are exciting times for the MHA and its Tanach students! Looking to follow in Asher's very big footsteps is a group of seven current MHA students who will be headed to New York this weekend to compete in the National Finals (nine qualified, but only seven are able to make the trip). We wish all of them the best of luck on Sunday and express our deep gratitude to their coach and mentor, Moreh Shimshon Solemon, who has given selflessly of his time inside school and well beyond to make sure that our students are best prepared for this unique challenge. This past Wednesday brought a new event to the MHA calendar: a community night of learning in celebration of our high school Matmidim Program. The Matmidim Program was created last year as a means of providing both the opportunity and incentive to our high school students to extend their Torah study beyond the confines of the classroom and the school day. Through Sunday morning shiurim, Tuesday night learning, chavruta study, and faculty monitored independent learning projects, our students were encouraged to find areas of talmud Torah that spoke to them and pursue them on their own time. On Wednesday night the community was invited to our high school Beit Midrash to get a taste for the remarkable learning which the program has inspired, and to celebrate the impressive achievements of our students in this regard. The evening featured a mix of full-fledged shiurim delivered by several of our students and "teasers" presented by others, as a means of interesting the crowd in reading the more elaborate words of Torah they authored which were printed in a booklet distributed at the event. The evening concluded with an inspiring siyum Shas Mishnayos made by 12th grader Gabriel Addess and his father and a light celebratory meal which followed. Below are several clips from our student presentations. Pictures from the evening can be found here. It is our hope that this wonderful evening was just the beginning and that our Matmidim Program is poised to grow and expand in the coming months and years. We began last week with a moving commemoration of Yom HaShoah. Students in grades 5 through 12 were invited to the gym where they first lit a candle before taking their seat. Six large candles were then lit on stage, each in memory of another group of our people who were lost. 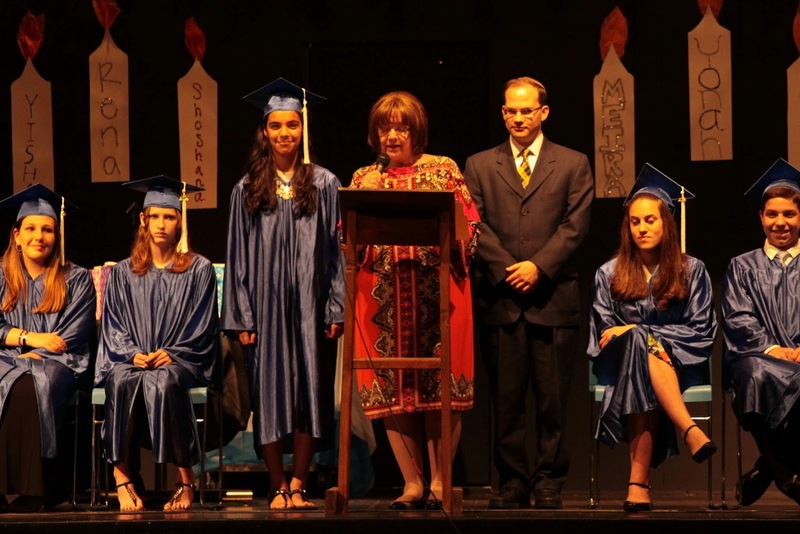 After a student led song, kel maleh, a few readings and some words from me, the high school students reenacted the thoughts of a survivor as he saw his victory over Hitler played out in the Jewish continuity of his grandchildren. The assembly ended with a moving video and Ha-Tikvah. This week brings us both Yom HaZikaron and Yom Haatzmaut which are sure to be both inspiring and uplifting for all of our students. 8th grader Rebecca Brown placed 3rd in this year's Memphis Jewish Federation sponsored Holocaust Art Contest. 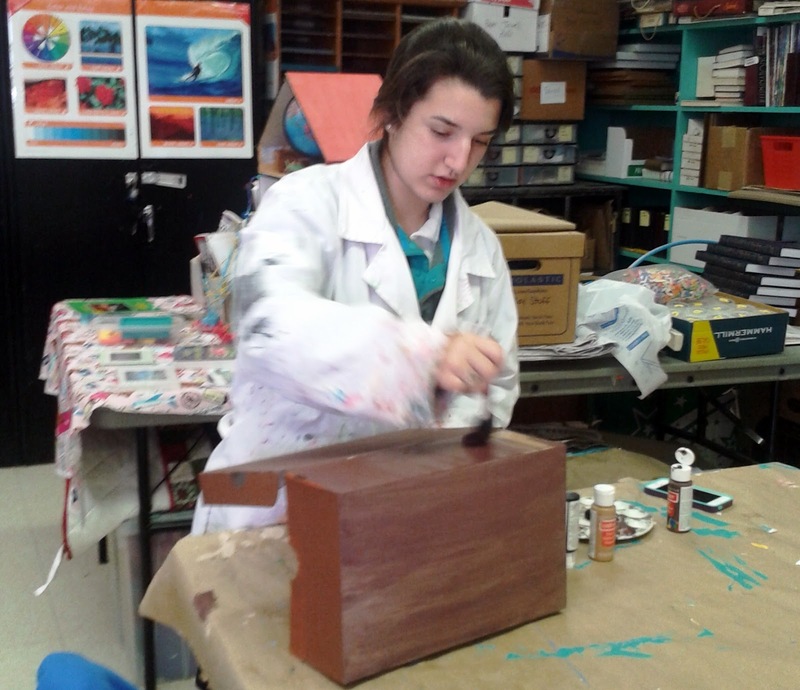 The contest, which challenges students Jewish and non-Jewish from across the region to create Holocaust inspired art in advance of Yom HaShoah, has steadily grown in recent years. Under the direction of our talented and dedicated art teacher, Mrs. Chany Fleishhacker, MHA students have competed for top billing each and every year. 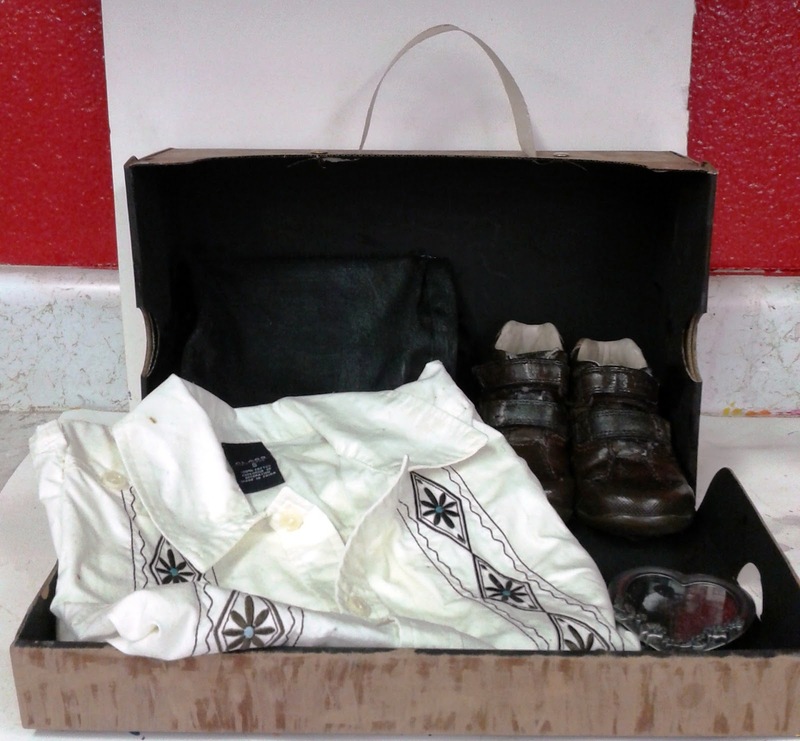 Rebecca, who has chosen to join us here in Memphis to pursue a Jewish education not available in her hometown of New Orleans, created a haunting representation of the possessions left behind by a victim of Nazi crimes. They demonstrate the simple, and innocent, humanity of which so many were robbed during that awful time in our history. Rebecca's work as well as the other submissions from MHA students are currently on display in the MJCC's art gallery and will be there through May 13th. I strongly encourage all who can to stop by and see them for yourselves. The school was alive with the sights and sounds of Pesach today. From the high school boys' leibadik rendition of Chad Gadya together with their Kindergarten buddies to the PreK's Pesach scavenger hunt with Rabbi Stein's shiur, and from model seders galore to Kitah Bet's glorious Pesach play, everywhere you turned it was clear that Pesach was in the air. For clips from the Pesach play see the Youtube playlist below. For pictures click here. Our science program took center stage last week as we held our second annual Science Expo. A non-competitive twist on the old Science Fair model, the Science Expo gives students a chance to publicly share a science-related project of their own design and the learning they did in order to create it. The younger grades, under the direction of Mrs. Triplett, joined forces to do a grade-wide project while the older grades, under the direction of Ms. Kolenic and Mr. Lewellyn, did their work either in small groups or as individuals. From hovercrafts to mag-lev trains and exploding balloons to dissected owl pellets, there was fun and exciting evidence of learning on display everywhere one turned. For more pictures from the evening click here. 11th grader, Alyssa Wruble was recently accepted into the prestigious Tikvah Summer Institute at Yale University. The Tikvah program selects a small number of the country's most talented 11th and 12th graders and brings them together for two weeks to delve deeply into some of the biggest questions that face us as American Jews. This year's Institute is entitled "Politics, Economics, and the Jewish Person" and features world class faculty such as Rabbi Dr. Meir Soloveitchik, Dr. Kimberly Kagan (founder and president of the Institute for the Study of War), Dr. James Otteson (director of the Center for the Study of Capitalism at Wake Forest University), and takes place on the Yale University Campus in New Haven, Connecticut. We have no doubt Alyssa will find the experience enriching and enlightening and we have no doubt that the Tikvah group will be similarly enlightened and enriched by the sharp wit and penetrating insight we've all come to know and expect from Alyssa. Circle your calendar...Tomorrow, Thursday, March 27th at 3:00pm CST the Cooper Macs will face Yeshiva Atlanta in the first round of YU's Sarachek tournament in NYC. The game can be watched online in HD at www.MacsLive.com. Keep an eye on MacsLive.com as we will also play Friday, Sunday, and Monday with times, opponents, and location depending on how we fare. 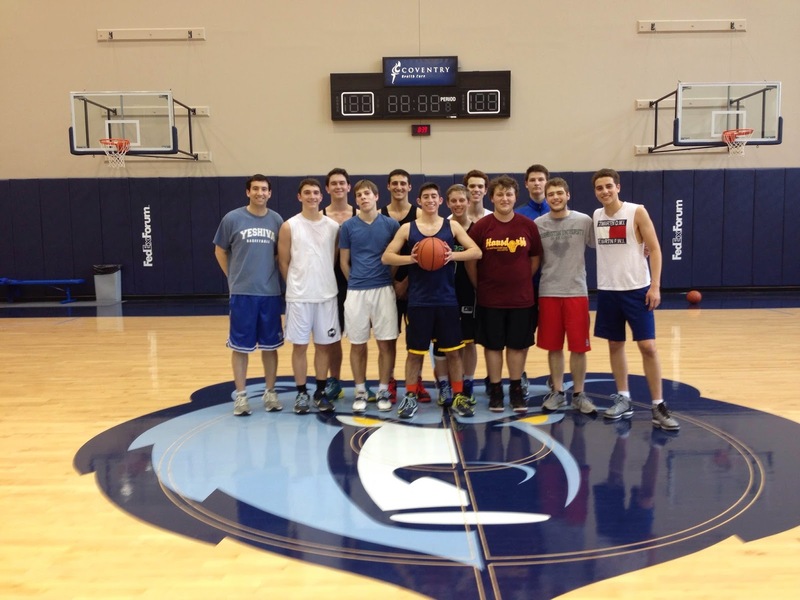 The team has worked very hard over the past few weeks to prepare, including practices in four different local gyms, film sessions, studying scouting reports, and even a special pre-Shabbos practice at the FedEx Forum in the Grizzlies practice facility. All of this while a majority of the team is on the Dean's List or Honor Roll and participates in many other extracurriculars/leadership roles...pretty amazing. This will be the last hurrah for the team's 7 seniors. While this is a different team after losing two-time Jewish Hoops All-American Eli Osdoba to graduation, it's one of the deepest squads our school has ever taken to Sarachek. And, the Macs have arguably one of the most exciting players in the tournament in Bryan Itkowitz. We hope to continue to build on the Sarachek success we've had the past two years, including a Tier 2 championship in 2012 and our school's first ever Tier 1 appearance last year. Regardless, we will have fun being in NYC together, visiting with alumni, and exploring YU's campus. Thanks for everyone's support throughout the year and we hope to end the season with a bang this coming weekend. Game Preview Here. Team Roster Here. This year Purim was just a prelude to the real Adar excitement here at the MHA. Picking up where the the 3rd graders left off with their incredible Purim play on Friday (click here for more pictures! ), the Kollel and Bat Ami had an exciting Purim Carnival waiting for all of the elementary school students when they returned on Monday, Shushan Purim. The carnival was followed by a video which the shlichim prepared and which the Junior High was invited to attend. Ask a 7th or 8th grader and they'll tell you that was a dead giveaway. Inviting the Junior High to a Lower School assembly could only mean one thing: COLOR WAR! And so it was. Starting Monday afternoon the school was a sea of blue and red as the students competed in what was widely regarded to have been the best - and most IKaRR filled - Color War our school has ever seen. From athletics to the all-new Cardboard Challenge, and from songs and cheers to skits and banners, these two spirit-filled days gave every child a chance to shine. Have a look at the videos to get a glimpse of what it was like and be sure to let Mrs. Gersten know what an incredible job she did putting it all together! 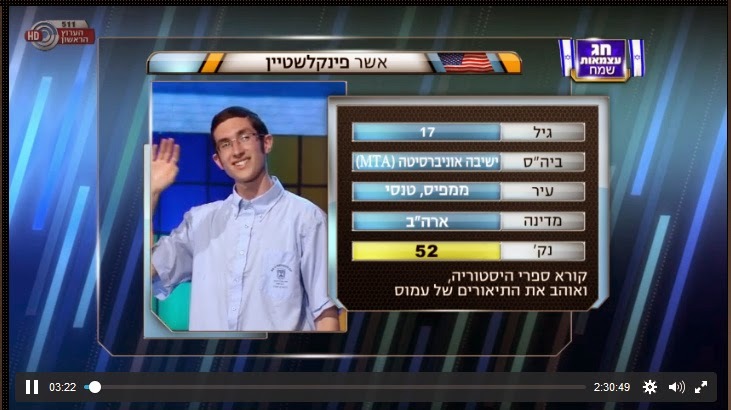 The results for the qualifying test for Chidon HaTanach (the International Bible Contest) are in and the success of our students is unprecedented. Tani Finkelstein and Ariel Kampf, both of whom are 9th graders and were up against 10th and 11th graders throughout the country, qualified to move on to the national finals in New York in May. Perhaps more startling, though, is that all seven of our Junior High students who participated in the program, also ranked high enough to move on to the national finals. 8th graders Shlomo Bosin, Batya Bosin, Chaya Klein, and Shmuel Perl, as well as 7th graders Akiva Finkelstein, Ezra Cooper, and Yisrael Weiner all prepared for the exams by putting in hours of extra study outside of school under the guidance of Moreh Shimshon Solemon. Their hard work paid off as all of them now have a chance to compete for the national title, a prize that includes an expense paid trip to Israel next year to represent the USA in the international finals. Given that last year's high school winner (Asher Finkelstein, pictured above) was an MHA graduate, I have no doubt that the competition will be shaking in their boots when nine MHA students show up to the competition this year! We wish them and Moreh Shimshon a heartfelt מזל טוב on their impressive accomplishment and, win or lose, we hope that this experience and their success to date will inspire them to reach higher and higher in their Torah study in the years to come. Congratulations to Isaac Graber who was named an Academic All-Star by the Commercial Appeal today. The award confirms what we all knew to be true already - that Isaac ranks amongst the truly exceptional students in our region both for his accomplishments inside and outside the classroom. Isaac, a senior, exemplifies the Renaissance Man. By his involvement in and contributions to a variety of social, cultural and educational organizations, he has been exposed to diverse communities. He holds a 5.19 weighted grade point average and scored 2240 on the SAT. Currently slated to be the valedictorian of his class, Isaac is a National Merit Commended Student and member of the National Honor Society. He has taken seven AP courses and 25 Honors classes. As a junior, he received the Yale Book Award for outstanding potential. As president of the Student Council, Isaac plans many school events. He also leads the engineering team as they compete in the TEAMS competition at the University of Arkansas. After attending the American Israel Public Affairs Committee (AIPAC) High School Summit in Washington in 2011, Isaac discovered a passion for Israel and Israel advocacy. He has made it his mission to educate his peers and the community about Israel. After Isaac attended the BridgeBuilder’s Summer Leadership Conference, he became very involved and now collaborates with other young Memphians committed to diversity.